Christian houses set on fire. What next? 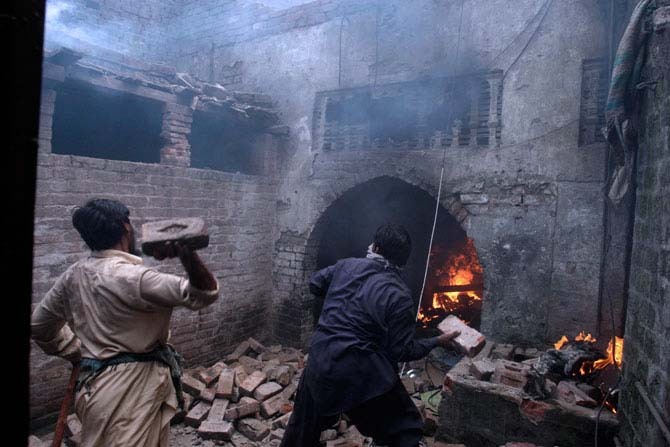 An angry mob set 40 Christian homes on fire today for an alleged incident of blasphemy. Through our past experiences, we already know how farcical these allegations are. But that did not stop the so-called angry mob to spare the homes of Christians who didn't even have anything to do with the whole incident. Who just happened to be living in the wrong place at the wrong time. Ironically I can bet that this same mob, which thinks it acted as a defender of God's word, has never gone to the mosque to pray, commits sins and adultery, and cheats and blasphemes against God's word everyday. Setting innocent people's houses on fire is the worst form of blasphemy that could ever have been committed. And who is going to prosecute them? What befuddles be is the kind of naivety our security agencies display. The SSP of Lahore for example, said that no houses had been torched. Pictorial and video evidence suggests otherwise. It's time for the minorities to leave. It's time for the white (which stood for minorities) in Pakistan's flag to be decommissioned. They came for the Ahmadis. Then they came for the Shiites. Now they've come for the Christians. It's only a matter of time before all our necks are hanging out. And the only reason this has happened is because our douchebag leaders, incapable, insurmountable selfish pricks, have no idea how a country is run. CM Shahbaz Sharif announced a compensation of 0.2 million rupees for the affected. Are you trying to slap an already brow beaten minority? 0.2 million for people who've lost everything? Who have nowhere to run and nowhere to hide? Who don't have their own homes anymore? I'm a Pakistani and today I'm ashamed to be one. At the very least I wish someone would make an example out of the people who did this today. But that's expecting too much from the likes of Rana Sanaullah who actually hangs out with people who are responsible for such brutal antics.